Indigenous Buddhist communities in Bangladesh’s Chittagong Hill Tracts (CHT)* have once again come under attack from Bengali Muslim settlers in the region. 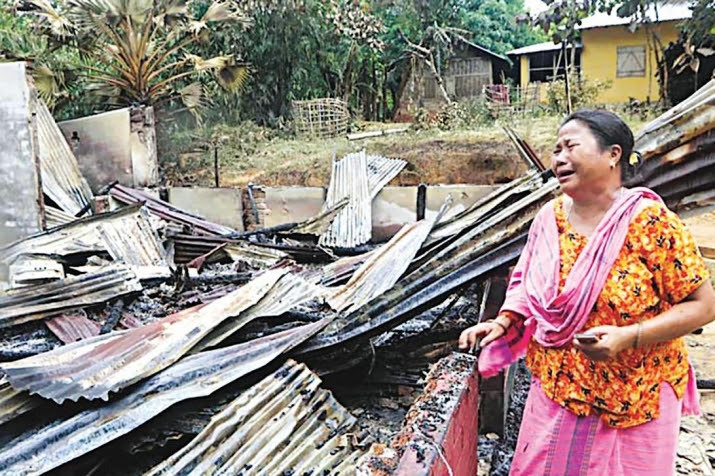 Local media reported that on 2 June, more than 200 homes of indigenous communities in Longadu, Rangamati Hill District, were torched, allegedly in the presence of army and police personnel. It was also reported that a 70-year-old woman, unable to flee, was burned alive in the attacks. Hundreds of Bengali Muslim settlers, who were protesting the recent death of local youth leader Nurul Islam Nayan, a motorcycle taxi driver, set fire to houses in six villages. Nayan’s body was found on 1 June at a roadside and the settlers have accused members of the indigenous community of killing him, however police had yet to investigate the circumstances of his death. News of the attacks was met with widespread condemnation as it spread over social media. The Human Rights Forum of Bangladesh, comprised of local rights groups, demanded an impartial investigation and punishment of the culprits. Another human rights organization, Ain o Salish Kendra, questioned how such acts could have been allowed to take place in the presence of police and army personnel. Amnesty International has also released a statement critical of the Bangladeshi security forces’ repeated oppression of indigenous people in CHT and urging Bangladesh’s government to punish the attackers and rehabilitate the victims. The 2 June incident is not the first in CHT. In 1998, 40 indigenous people in Longadu were killed in attacks. In 2010, more than 400 houses and Buddhist monasteries of indigenous communities were burned down in Rangamati. In each case, the attacks were allegedly supported by, or were carried out in the presence of, security forces. Protestors on social media compared the repeated attacks with the 1971 Bangladesh genocide by Pakistan’s military during Bangladesh’s bloody nine-month war for independence. The CHT are located in southeastern Bangladesh. The three hill districts are home to more than 11 indigenous communities, most of whom follow Theravada Buddhism. This entry was posted in Bangladesh, News. Bookmark the permalink.